SEO without Back-linking, in year 2015 is a very popular series and a new blogger, so like to get hands-on traffic only using the best ways for perfect SEO because search engines, like a Google Search are very smart and know all about Webster/blog. So you are just using this correct SEO method and you can get Good traffic from search engines easily. 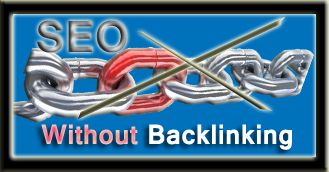 Google and other search engines are know how much your site/blog Backlinks. But they also watch your other thing to high rank your page in searches, and (Boost) your blogger traffic. I tell you some effective ways of doing good SEO results without Backlinking to other sites. What you doing without Backlinks? 1: user wants real and targeted information, so write correct and real information about your topic. And don't write lengthy posts, just write to the point and correct information. 2: don't use long tail keywords, and try to add relative keywords in blog post. Must add targeted keywords in the title of your post. You can also use Google Keywords Planner. 3: for good response to your users, exclude your blog speed. Forget good response from search. And your page is open in just 5 to 7 seconds. Because people like if your page are open in seconds. 6: Social Media Optimization is also helping in ranking to search engines. And if you are one to to get traffic from social media like Facebook, Twitter, Google Plus, Linkedin, and other social networks, then you get high rank of your website/blog and search engines are like to indexing your post very fast.